This is a duplicate of my article from the LSE Impact of Social Science blog which was published today. You can find the original here. The Open Education movement is now around ten or twelve years old and has started to make a significant difference to education practices around the world. Open educational resources (OER) are resources (article, textbook, lesson plan, video, test, etc.) that might be used in teaching or learning. They are considered ‘open’ when they are openly licensed in ways that [permit] no-cost access, use, adaptation and redistribution by others with no or limited restrictions or, more simply their free use and re-purposing by others. This distinction might seem rather subtle and legalistic at first. But the whole of the open education movement is predicated on the idea that open licensing leads to far reaching and beneficial change. By providing an alternative to traditional copyright, open licenses make it possible to share and repurpose materials at marginal cost. It is often stated, for instance, that OER have the potential to increase access to education through lowering the prohibitive cost of textbooks or journal subscriptions. Some claim that OER allows for more innovative teaching and closer bonds between students and learners as a result of a more reflexive syllabus. Others hold the view that open licensing will align existing pedagogies along more collaborative and networked lines. When open licensing in conjunction with digital technology can enable duplication and adaptation of materials almost anywhere in the world at next to no cost, it’s easy to see how the implications may be manifold for educational institutions. Perhaps the strongest evidence for this thus far comes from the open access movement, which continues to leverage academic publishers for better value. Unsurprisingly, much research has gone into ascertaining the evidence that exists in support of these claims. A good portion of earlier OER research focused on establishing the relative quality of open materials and found that they are generally at least as good as equivalent commercial materials (though there are of course variations in quality). But there are reasons why establishing a clear picture of the wider impact of OER adoption is more complex. Let’s leave aside for now issues around the much discussed and yet nebulous term “impact”. OER adoption is taking place within a world of education undergoing radical change. Where OER does change practices there are often multiple interventions taking place at the same time and so it is hard to isolate the particular influence of openness. Use contexts can vary wildly between countries and education levels, and cultural differences can come into play. Furthermore, much sharing and use of open educational materials (such as Wikipedia) is relatively informal, difficult to observe, and part of a wider pattern of activity. This is not to say that there isn’t good quality OER research out there, but the typical dependence on softer data might sometimes be thought unconvincing. Further complications can arise from inconsistencies in understanding what ‘open’ means to different groups. Nonetheless, there remains a need for evidence that would support (or discount) from the key claims expressed in the rhetoric around OER, as well as an overall picture of global activity. What the open education movement needs is a way to draw together disparate fragments of evidence into a coherent analytic framework that can support judgments about OER impact for a range of use cases. OER Research Hub (OERRH) is a research project in IET at The Open University which approaches these issues through an open and collaborative approach. Our project aspires to be open in both its focus and the methods we use to gather and share data. We’ve taken a mixed-methods approach to research depending on the context, and we’ve also undertaken some of the largest surveys about OER use and attitudes from a range of stakeholders. By using a survey template that is consistent across the different samples it becomes possible to see patterns across countries and sectors. Our research instruments and data are released on open licenses and we have an open access publication policy. By encouraging a culture of open sharing we have been able to consolidate the efforts of OER practitioners and help to build a shared understanding. We work openly with a range of collaborators around the world to gather data and share practical experience and also have a fellowship scheme that helps to foster a worldwide network of experts. By focusing on collecting data around ‘impact’ in situ we are able to build up an evolving picture of changing practices. The analytic framework for pulling together the data includes a set of research hypotheses which reflect some of the main claims that are made about OER. These help to provide focus but a further structuring is provided by the use of geospatial coordinates (which are of course universal) and map disparate data types on a map across a shared geographical base. Mapping has become popular within the OER world, and there is a lot of interest in maps for strengthening communities and as tools for building a shared understanding of the world. 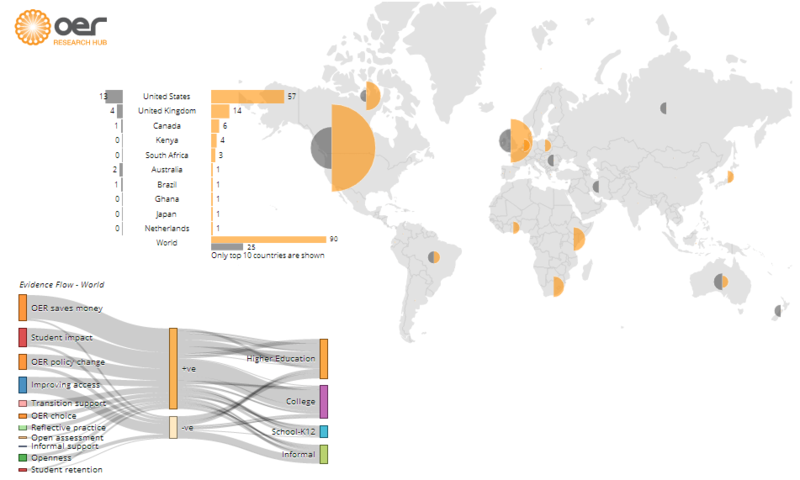 Accordingly, OERRH’s OER Impact Map acts as both research tool and dissemination channel. By using a simple metadata structure for different data types it becomes possible to visualize (as well as simply ‘map’) information. For instance, real-time reporting of the evidence gathered across each hypothesis or visualising the sum of evidence gathered help us to understand the data. Soon it will be possible to browse the project survey data directly as well as interact with more detailed, structured narratives about OER impact. The map itself will continue to help us to see patterns in the data and cross-reference evidence gathered. By no means is OER Impact Map complete; by its nature the data set continues to evolve. 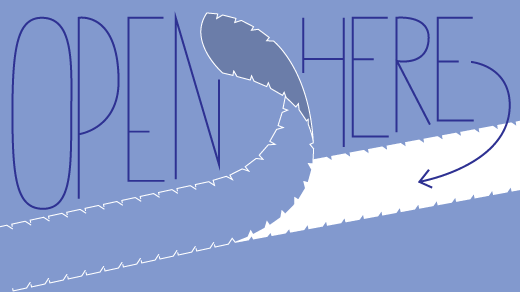 But openness is the key to the sustainability of a service like this: by inviting the open community to contribute directly and submit their impact narratives to OERRH the data can continue to grow iteratively and support the decisions made by educators, students, policymakers and advocates. Furthermore, open licensing of evidence records allows us to close citation loops and archive data more easily, and the relative ease with which open access research can be found helps it find it way into the evidence base. It is worth noting that the combination of mapping and curation can be flexibly applied to other research questions in educational and social science. The code for OER Impact Map is available openly on GitHub, meaning others can use it build their own impact maps: or adapt this code to their own needs. The impact map is based on a JSON information architecture which supports multiple programming languages and flexible use of the data (like combining it with other datasets). What our project illustrates is that the use of openness to solve challenges in the project can lead to innovation in approaches in understanding impact. The combination of mixed-methods research into hypotheses with mapping and data visualization techniques can be flexibly applied in support of traditional research activity. Rob Farrow is a philosopher and educational technologist who researches open education at The Institute of Educational Technology, The Open University (UK). He blogs at openmind.ed and tweets as @philosopher1978.